Children with communication disorders’ responses to a long established psychological test may have been ignored or altered for many years according to recent IOE research. Since 1985, psychologists have used the ‘Sally-Anne test’ to examine children’s ‘theory of mind’. Theory of mind refers to people’s ability to understand that other people have mental states- beliefs, desires, intentions and perspectives which differ from our own. This is important because an understanding of others’ mental states is crucial for normal social interaction. Without an adequately developed theory of mind an individual is unable to understand that others have a differing point of view or experience to themselves. Consequences can include difficulty with communication or social closeness. Some psychologists even believe that a fully developed theory of mind is a prerequisite for empathy. Children with autistic spectrum disorder (ASD) often fail the theory of mind test and this evidence has been central to explanations of their social and communication difficulties. However it now appears that children with ASD’s perceived ‘failure’ of the theory of mind test may be exaggerated and alternative explanations of their social and communication difficulties may therefore need to be further explored. The Sally Anne test involves participants observing a puppet scenario, detailed in the image opposite, and answering questions about the puppets’ knowledge. 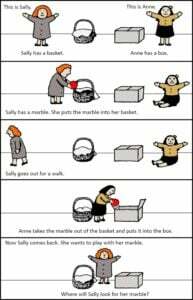 In the puppet scenario, Sally puts her marble in her basket and leaves the room. While Sally is away, Anne moves the marble from the basket to the box. Sally returns to the room and the test participant is asked “Where will Sally look for her marble?” this is the belief question. A correct answer is “the basket”, but this requires an understanding that Sally does not know something which the participant (and Anne) know. This understanding is a core component of theory of mind development. The majority (85%) of typically developing 5 year olds ‘pass’ the test by answering correctly, whereas the majority of 5 years old with ASD (80%) answer incorrectly by answering or pointing to the box. The test is not used to diagnose autism but is thought to offer some insight into why children with autism have difficulty functioning in social situations. The prevailing view since the first Sally-Anne experiments in the 80s has been that many children with ASD do not ‘pass’ the test because they do not develop theory of mind in a typical way. These results have been compared with results for children with Down’s syndrome, who ‘pass’ the test about 85% of the time, showing no deficit compared to typically developing children. This shows that difficulties experienced by children with ASD are not simply developmental but due to an impairment specific to ASD. However, are children with autism really failing the test because they lack a theory of mind? Some argue that in fact children with ASD do have theory of mind, but cannot successfully complete the Sally-Anne test because of language difficulties and deficits in attention, memory and inhibition. The new IOE study suggests an alternative view: that children with ASD do have theory of mind and can succeed at the Sally –Anne test, despite their language, attention and memory difficulties, but researchers’ interpretations of their responses and behaviour have overlooked their ability. In the new study, researchers examined videoed responses from two children, one with traits of ASD and one with an ASD diagnosis. They found two interesting features of the interactions that may suggest that the complexity of the testing interaction, rather than a lack of theory of mind, is the cause of ‘failure’. When a child took a long time to answer or gave an unclear or quiet answer, the tester repeated the question. Repetition of a question is often perceived as a social cue that the answer given was inadequate. In both cases, the child changes their response when this happened. Actions such as picking up an object, tapping it on the table or visually inspecting it were not considered as responses. These repetitive actions, characteristic of ASD, are often seen as unrelated to social interactions, but experiments of other skills have shown that these actions e.g. tapping, actually indicate a child is paying meaningful attention to a particular object or trying to communicate something relating to an object. Although this study only involved a small number of participants, it suggests that children with ASD might be trying to indicate their answers in a range of ways previously over looked by researchers. Furthermore, this example may mean that children with ASD perform poorly on a range of tasks not because of a deficit in their ability but because of the effects of social interaction confounding task success. It adds evidence to some theories that the way tests, experiments and assessment are conducted bias results to indicate that the child being assessed has some difficulty or deficit. 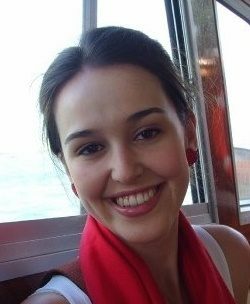 If the findings can be replicated at a larger scale it may have implications for our wider understanding of communication disorders and psychological testing. If we have previously misunderstood these children and young people, we may have provided incorrect explanations for their difficulties. This research is in its very early stages but in future it may lead to a greater understanding of children and young people with developmental disorders which ultimately, may allow us to better appreciate the difficulties they face and provide better interventions and assistance. Firing on all cylinders: What makes an effective middle leader?